Prime Minister freezes Shaked Committee vote on sanctions for draft-dodging after controversy erupts over length of Hesder service. Prime Minister Binyamin Netanyahu has ordered Tuesday that the vote over which sanctions are to be given for hareidi draft-dodgers - economic or criminal - be postponed until a conflict within the Shaked Committee over the length of service for Hesder yeshiva students can be worked out. 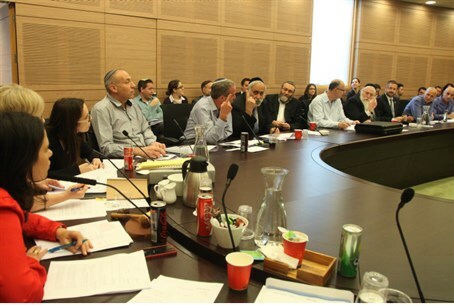 The drama unfolded during the Committee meeting when MK Eliezer Stern (HaTnua) requested a revote on whether or not the army service chapter of the Hesder program, which combines Torah learning with army service, will be lengthened. Hareidi MKs then stated that they would, indeed, vote for the service to be lengthened. One United Torah Judaism MK told Arutz Sheva that the move was in response to Jewish Home, who finally agreed with Yesh Atid Tuesday to allow criminal sanctions to be enacted for hareidi draft-dodgers - albeit with a few caveats. "You push us, we'll push back," the MK fired. The Prime Minister then allegedly ordered MK Tzahi Hanegbi to leave the session and not to vote against the ​Hesder service extension, after realizing that Yesh Atid and Jewish Home had formed a "deal" to keep Hesder yeshiva service at the status quo. At this point, Netanyahu put the vote on hold until internal conflicts could be worked out within the coalition. It is unclear why Netanyahu protested the move, as an agreement signed between the Likud and Jewish Home upon the latter entering the coalition included a clause ensuring that Hesder army service would remain as it is: at 16 months. The move comes just hours after MK Uri Orbach (Jewish Home) lamented in a Facebook post that the hareidi community has been seeking revenge, so to speak, on the religious Zionist community despite the latter's efforts to take the hareidi community's needs into account with the new laws. Orbach noted that Hesder yeshivas have bore the brunt of the backlash. "We have paid the price now that the Hesder yeshivas are facing cuts, because [MK Eliezer] Stern and the secular factions are apparently despairing on the hareidi draft issue," Orbach stated. "In all our efforts to appease the hareidi community and show that we care about the Torah learning of the hareidi world (even those who don't actually sit and learn), we seem to have forgotten that the ideal is a combination of army learning and Torah study," he added. "That a man has to provide for his family and also learn Torah. Yes, nonsense like that."